Life is good. While many complain, gobble up the spoon-fed fear from media outlets, and blame the other side for everything wrong in our society, traveling makes it clear: we have it good in the USA. That’s not to discount real problems that affect individuals like unemployment, lack of healthcare, poverty, and hunger. Those are painful realities for some Americans that need to be addressed. But we live in one of the wealthiest, most powerful, and most influential countries in the world. People considered “poor” in our country would be considered wealthy in most of the world. Still, people complain about our lethargic economic growth rate—2012 third quarter at 2.7%. Sure, there are other countries that have higher growth rates–like Cambodia, Costa Rica, and Botswana. But growth rate completely ignores two important economic measures: how wealthy we are to start and the gap between a society’s wealthy and impoverished. As we excel in both, we have the capacity to address that gap. But we don’t. Sadly, the chasm between rich and poor grows wider and wider day by day. While most of this is an abstract reality—far removed from our own lives, it becomes vivid—walloping your worldview–when you finally see it with your own eyes. While you can find examples of this here in America, traveling just south of our border into the developing world puts the effects of wealth disparity in clearer view. That’s why, my recent trip to Mexico deepened my gratitude and changed how I see the world and my place in it. Through my church, I volunteered with a secular, home- and community-building organization called Esperanza International. Tijuana families who seek help from Esperanza commit to helping other families in their community build their homes while saving and contributing funds for their own future dwelling. When it’s their turn to receive funds to build their home, previous loan recipients, extended family, and neighbors help with the construction. Community organizations that are comprised of neighbors and advised by social workers from Esperanza are empowered to lead its members, to foster community building, to troubleshoot concerns, to collect payments from participating families, and to make decisions about who receives future loans. They work out payment schedules with the participating families that are commensurate to the family’s income–meaning if a spouse loses his/her job, the payment rate is reduced until the household’s wages increase. 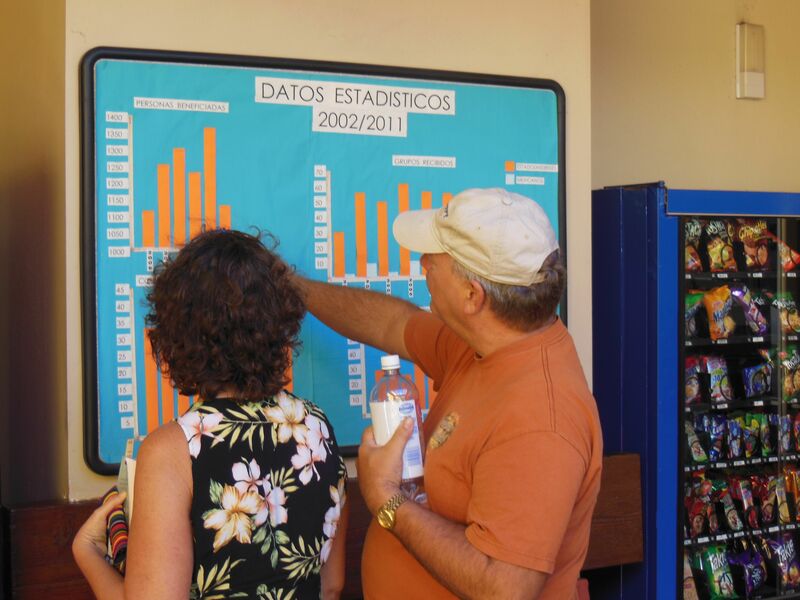 Volunteers Susan and John check out how much Esperanza has helped families in Tijuana. It’s a compassionate, practical model that’s been around since 1985. With more than 7000 volunteers just in the last seven years, Esperanza oversaw the construction of more than 200 Tijuana homes, positively impacting the lives of so many adults and children who finally have a home to call their own. 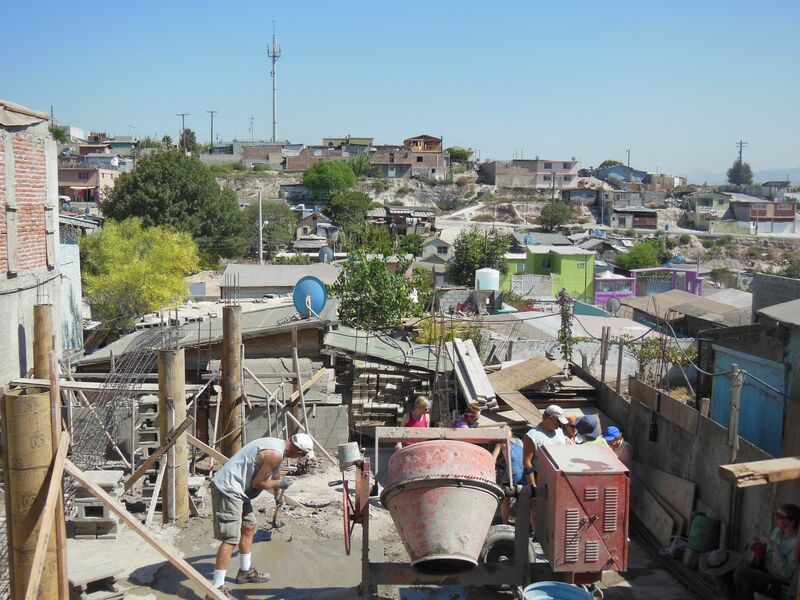 On our weeklong volunteer trip, we worked in three different colonias or neighborhoods, working on different phases of construction for three beautiful, loving, and hardworking families. Each of them welcomed us with warmth, gratitude, and dignity. 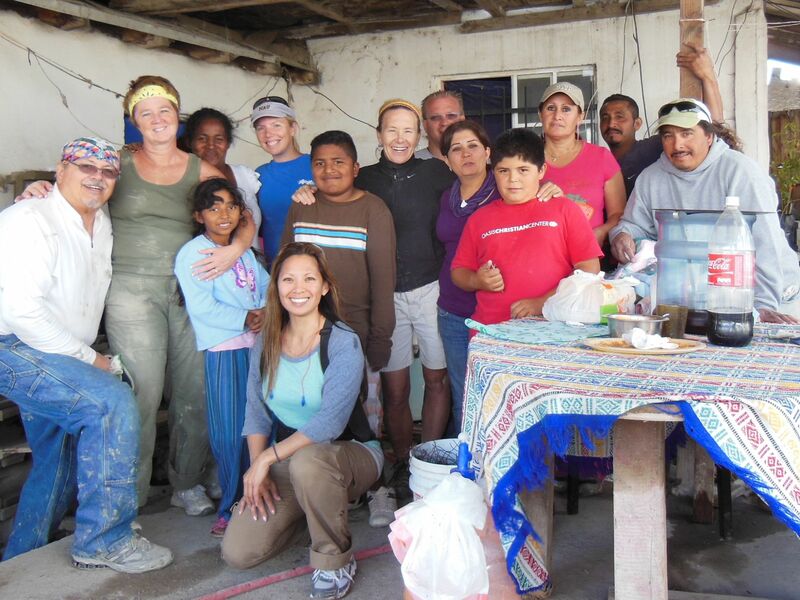 They were thankful for the assistance that we and Esperanza were providing. And they were proud of the financial and physical contributions from their family, neighbors, and friends. This just felt so right: uniting the strengths of people from bordering countries to make the dreams of a safe, stable, and flourishing home a tangible reality for people in need. 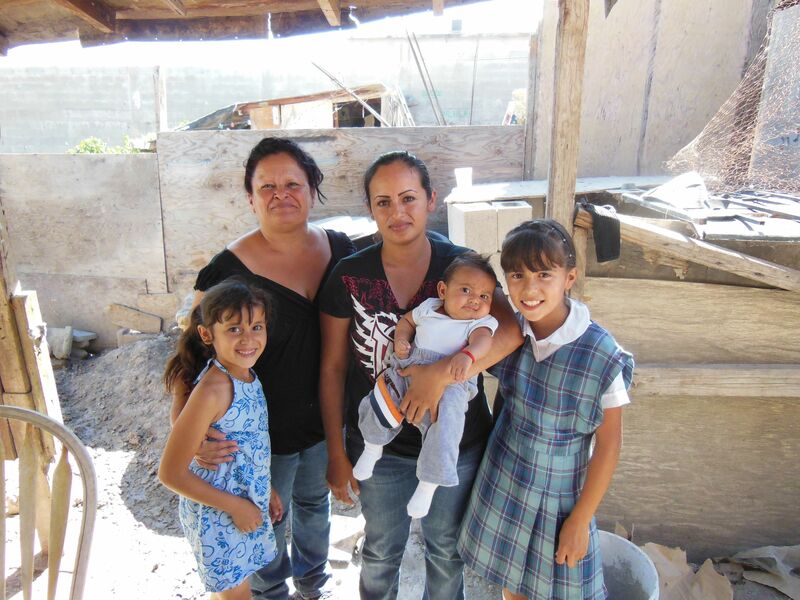 This happy family may not have much, but they have each other and help from family, friends, and Esperanza. One might be fooled into believing that based on their present living conditions, the neighborhoods they lived in, and the absence of “stuff” in their lives, these families would want to go somewhere else to escape this way of life, to emigrate to the U.S. to look for better opportunities, and to hope for something, anything better than this. But they were appreciative of what little they had. By no means were these people destitute, but neither were they middle class or even lower-middle class families. They were poor, getting by on small salaries, making do with what they had. And although they may have been lacking material wealth, they were certainly rich in happiness and family love. They knew that, despite what little they had, they were blessed. Nonetheless, I couldn’t live like these families do. Not too many people I know could. One of the neighborhoods where we volunteered. One family who was new to Esperanza had been living Old Mother Hubbard-style with seven family members shoehorned into a 15×20 ft. space they called home. Potable water was delivered weekly. The chalky beige earth upon which their “home” stood lacked proper drainage, so that when heavy rains came, mud sloshed through the house and continued down into the neighbor’s yard. The father worked two jobs, limiting his precious time with the family. And if not for the help of Esperanza, this would continue to be their fate. But this–and even much harsher conditions–is the standard for more than half of the world. More than 3 billion people live on less than $2.50 a day, and more than 80% of humanity tries to get by on less than $10 a day. Not because of temporary unemployment or because they’re not trying hard enough. This is simply their lot in life, from which it is difficult to escape. Most of us can’t even imagine what it must be like to live without the luxuries, the conveniences, and the basic necessities that so many of us enjoy. Or perhaps we simply forget to be grateful for our bountiful blessings. I wanted to learn more about life in Tijuana for these families. Whenever we had a break, I took advantage of my language skills to speak with the family members, and, more importantly, to listen. The adults were proud to share their stories of how they encountered Esperanza (usually because they saw a neighbor’s home that had been built via this organization), what they hope for their families (adequate homes, decent wages, better opportunities for their children than they had), and what challenges they face (a struggling economy with few opportunities for any upward mobility; limited social resources from the government; being strong role models for their children; raising them to value education, family, hard work, and love). At least one member of each three-generation family has a stable job, all the children attend school, and often the mother or grandmother runs the household. The intergenerational bonds are strong and evident. Everyone functions with the idea of doing what is best for the family. Everyone, even the little ones, contribute in whatever way they can, even if that means studying hard and just being good so the adults can focus on pouring concrete or cooking lunch for the volunteers. Spending time with the kids was even more enlightening. They were the happiest of all, as children often are. I don’t think they were oblivious to their surroundings, but they were content with where they were and with what they had. Evelinda was excited about school and practiced her reading skills with me. Her sister Catarina was pleased enough to listen to her older sibling and to play with the knotty-furred dog. Each day I saw them, they greeted me with hugs that kept me motivated to work as hard as I could…for them and for their family. Tony teaches the boys construction skills. 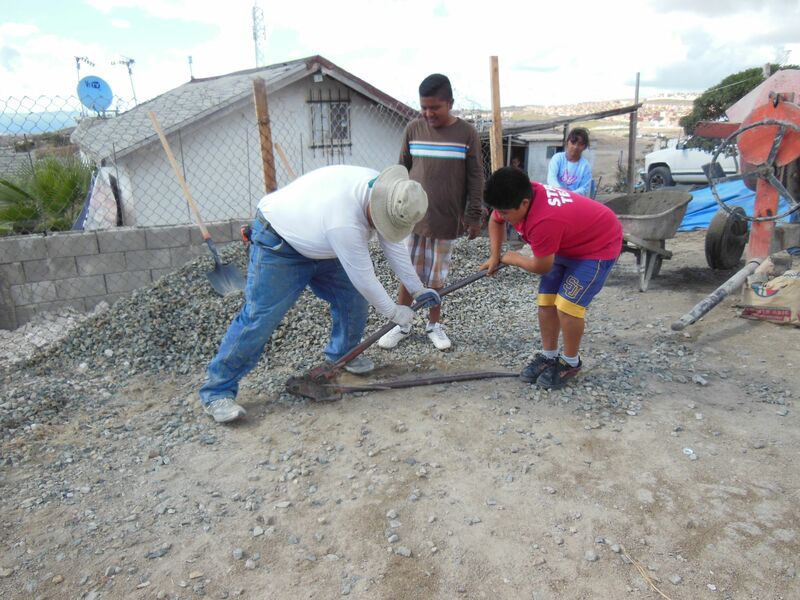 Josefina, her brother Antonio, and their cousin Miguel insisted on helping the adults and worked as a team to carry one long piece of rebar. The boys soon tired of that but quickly became fascinated with the machine that bends the rebar. Meanwhile, Josefina helped reposition rocks on the tarp covering the sand pile–from which I was filling buckets to help make concrete–to stop the wind from blowing it all away. As the wind picked up and heavy rain started to fall, all the adults took shelter on the patio, while the children danced, laughed, and embraced life as drops of water drenched their hair and tickled their faces. Can you remember when you were last in awe of the rain? In that moment, I thought about what treasures these children are. I thought of my own nieces and nephews, my former students, and the kids in my town. I thought that the children I’ve met here in Tijuana are no less precious than any other child, and all of them deserve, at the very least, basic shelter, easy access to clean water, good educations, and loving families. Their parents are doing all they can to provide them a better life, given the circumstances they’re in. My own circumstances afford me the opportunity to live a higher quality of life, but they also offer me the chance to help those who don’t. It’s not out of obligation, but, I think, out of simple human kindness and common decency. 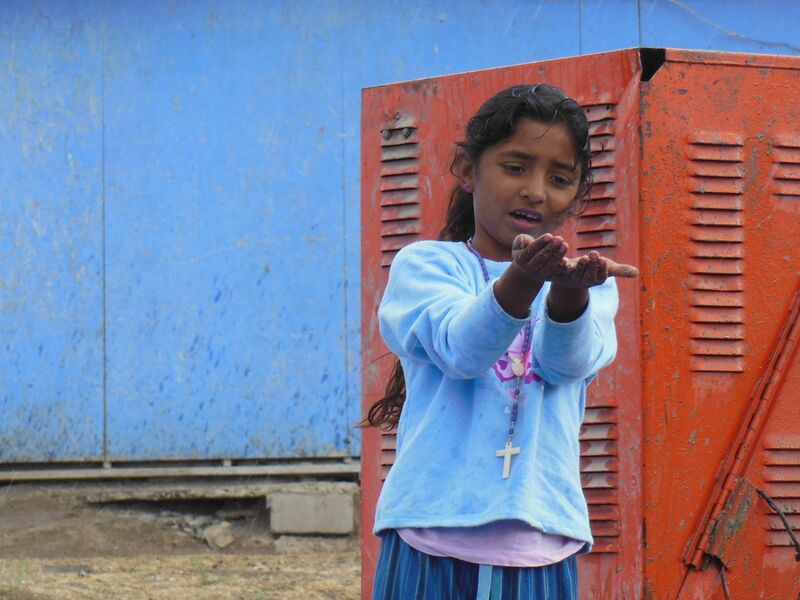 We may be here to help these families, but we’re the ones learning a lot about life from them. I think we’re all inclined to be good. I think we all hope for a world where there is no hunger, no poverty, no war, and no strife. Yet it’s important to remember that what we envision for ourselves is not necessarily how others envision life for themselves. As volunteers with Esperanza, we’re not here to tell these families how they should live their lives, how to become more “Americanized”, or to teach them the “right way” to do things. We are merely here to help fulfill their goals of having their own home in which to raise their families. These wonderful families that I’ve met already understand better than most that life is good, something I am continuing to learn and embrace. They are determined to work hard to make life even better for their descendants. And I’m grateful for the opportunity to help. This is beautifully written! Please let me know if I can connect it to Esperanza International’s website. I’m so sorry for taking so long to respond to you, Amanda. By all means, please link it to Esperanza’s website. Thank you for your kind words and for your interest in the article. My experience with Esperanza was a transformative one, and I’m so happy to share that with others.